Eating a balanced breakfast sets you up to succeed in your healthy eating and your focus for the entire day. Studies support that you need to start your day off with a healthy breakfast because there are many benefits to eating it. Eating breakfast can lift your mood. People who don’t eat breakfast are more tired and irritable. Before you eat in the morning, your body (like a car with little gas) is running on empty. You get energy from high-quality protein, carbohydrates, and fats. Studies show that if you eat breakfast, you’re more likely to be at a healthy weight than people who don’t eat breakfast. 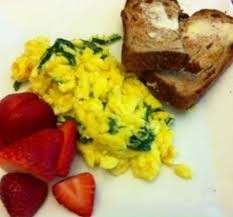 Having an egg or two, with some low fat cheese or turkey (I put vegetables and/or spinach in mine) and a piece of fruit will give you great protein, minerals and vitamins. If you are able to put in some flax, chi or other seeds into your eggs, then you are adding good carbs and fiber. For those who are able to fit in the carbs for the day count of 50 to 100, you can have a slice of whole grain bread or just a small measured portion of oatmeal (depending on the brand is oatmeal, a cup of oatmeal is about 30g of carbs), whole-grain cereal (not the high sugar Honey Nut Cheerios). Try a little almond butter instead of butter. 2 tablespoons of peanut or almond butter equals 6g of carbs. Another great breakfast option is Greek yogurt. Strawberries and blueberries are great in yogurt, cereal and oatmeal. Please pull out a measuring cup and become acquainted with how small a cup is vs. what you might thing a cup looks like in your mind. 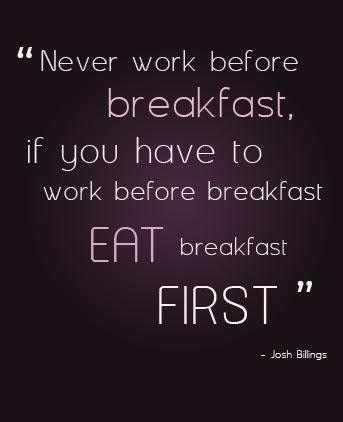 One of the most common excuses for not eating breakfast is being short on time to get to work or school. But breakfast doesn’t have to be fancy or time consuming. You can wake up just a little earlier to fit in a nutritious breakfast. The small investment in time in breakfast (and in you) pays off through the whole day. If you really love cereal, then compromise and put a few for flavor and texture in your oatmeal or your yogurt. *You can make a quick smoothie with yogurt and fruit, with some ice cubes. Throw in some chi or flax seeds. *Western Bagel and some low carb places sell low carb bagels. The Western Bagel Perfect 10 bagel is really good. Lots of fiber and protein and 10g net carbs. Get them at Westernbagel.com and refrigerate them. *Have hard-boiled eggs available and ready to grab on the run. Places like some selected Costco and Trader Joes has them already hard-boiled and peeled, in bags, for those who really are super busy. *Low carb shakes in a can (like Pure Protein) or low carb protein bars (like Power Crunch or Nature Valley Protein Peanut Butter Dark Chocolate). **Come on, scrambled eggs don’t take that long.